The Events List 2009 is downloadable as a single sheet of A4 in PDF format. Please note that at this stage all entries on this page are provisional and liable to change. The meeting to be followed by the Annual Fun Party for which a small charge will be made to cover expenses. Last year, though our Fun Party was popular, our Annual General Meeting was sparsely attended. So this year we are generating synergy and saving energy by combining the two. Our chairman, Alan Lowman, loves parties as does our new President. 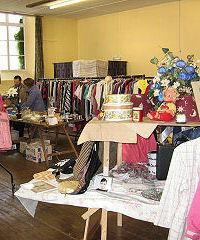 Our objective is to have a good party and come away enthused with the notion that "funding the fabric" is fabulous! 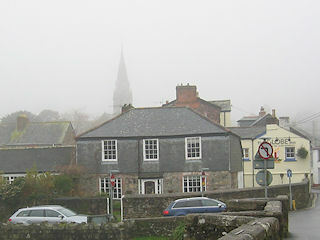 Jonathan Mann studied the organ in Launceston with the late Royland Jordan, with whom he gained his ARCM and entry to the Royal College of Music. Whilst there, he studied choral training under Sir David Willcocks, and the organ with John Birch (Chichester Cathedral), being awarded the Parratt and Haigh prizes for organ playing in his third year. This led to a further year of study, after graduating, specialising in organ playing (with John Birch) and theory and composition with Dr William Lloyd Webber. Returning to Cornwall, he resumed studies with Royland Jordan, and was for many years Organist and Choirmaster of St Mary Magdalene's Parish Church, Launceston. He has broadcast on both radio and television. 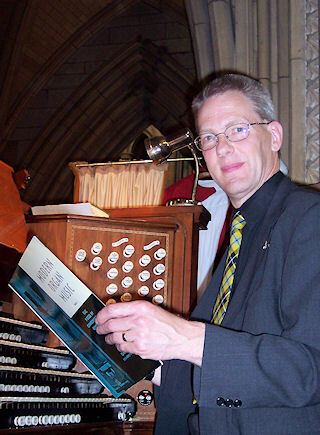 He directs the Launceston Choral Society, and is Assistant Music Director of the Launceston Male Voice Choir, as well as being Chairman of the Royal School of Church Music, Cornwall Area, and Diocesan Organ Advisor. As a contrast to this, he enjoys working full time for the Launceston Steam Railway. In his spare time, he designs railway publicity materials, is a volunteer Driver on the Talyllyn Railway in Wales, and plays the Cinema Organ! 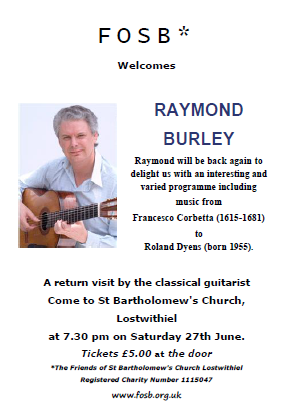 This will be his second concert at St Bartholomew's Church, Lostwithiel, and like the first, the music will demonstrate the instrument's versatility for the performance of music of a wide range of styles, including music written for the organ by composers such as Bach or Handel, arrangements of classical orchestral music, light music, and also novelty items which were so popular in the 1920s and 30s. The church is fortunate in having a good instrument which is used regularly, and is well maintained, with a useful range of tonal colour. Last year's concert was billed 'Hear the organ as never before'! 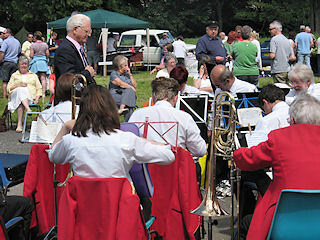 Whilst the same heading clearly cannot be used this year, you can be assured of an entertaining and varied programme. 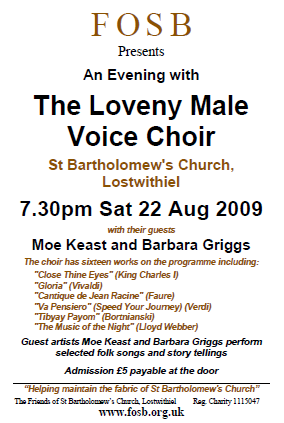 22 Aug 09 7.30 pm St Bartholomew's Church, Lostwithiel. Tickets £5.00 in advance from FOSB committee members and on sale at the door. A glass of wine or fruit juice will be served during the interval. 17 Oct 09 7.30 pm Church Rooms, Lostwithiel Horse Racing Event. Apologies, event cancelled. There were copyright issues which made it impossible to proceed. David Braine is the weather presenter on 'Spotlight' on BBC1 in the south west. He is also a good speaker. Admission £5.00 (including a glass of wine). 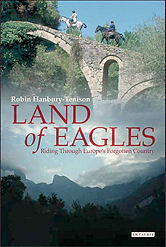 Illustrated talk by explorers Robin and Louella Hanbury Tenison about their journey across Albania on horseback. Tickets £5.00 at the door. Robin will be signing and selling his book. A bar will be available.